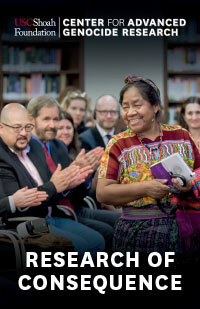 At just two years old, the Center for Advanced Genocide Research has taken shape as a multidisciplinary hub of the Institute’s research activities. Michigan student Brandon Bartley shares how testimony inspired him when he participated in the IWitness Detroit program last summer. Stephen Smith will give a keynote address and New Dimensions in Testimony will be demoed at the festival's Alternate Realities interactive exhibition. ​Once students have put the finishing touches on their videos and submitted them to their teachers, it’s time to start judging. IWitness celebrated a milestone in March: the most registrations ever in a single month. The milestone comes at a busy time for IWitness. The University of Texas at Austin and Texas A&M University are each hosting presentations about USC Shoah Foundation, the Visual History Archive and its possibilities for research this week.